Breathtaking mural in Nørrebro, by Grito. July, 2014. Copenhagen, Denmark. A small city with a cosmopolitan aura, it’s one of those places that feels like you’re in five different cities at once, it grabs your heart instantly! People are friendly, open and know how to have a good time. 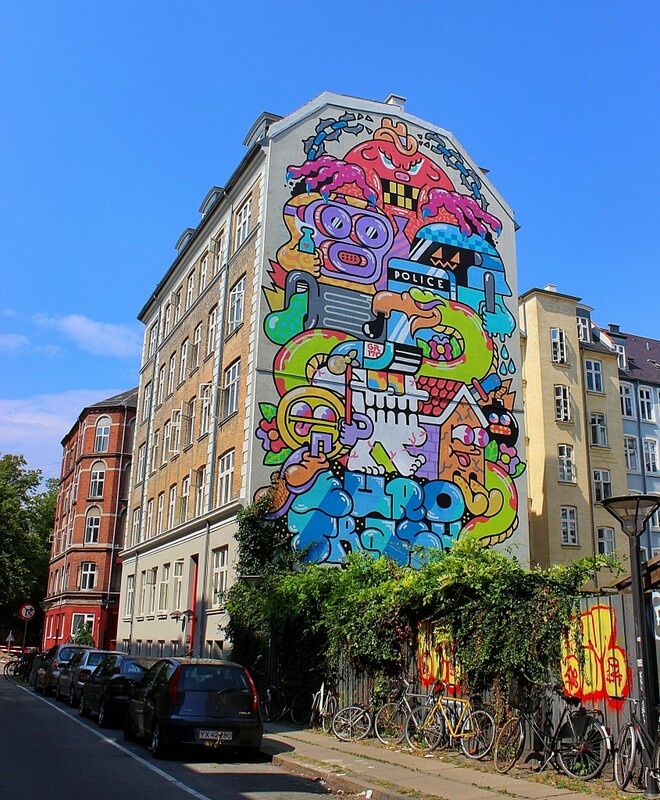 The city is full of great graffiti and street art, people have truly taken over the public space and it makes Copenhagen a canvas full of color. Like any other northern european city it’s best to visit in the summertime, or at least from May to September, so you really get to enjoy the city! 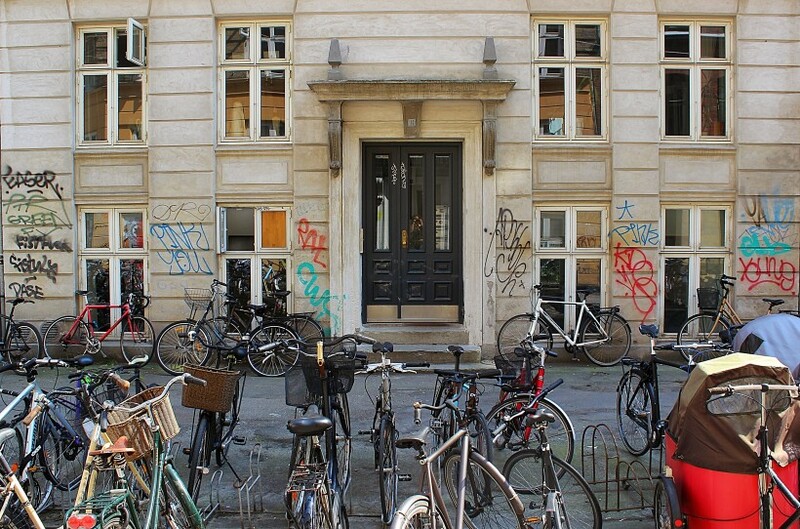 A common sight in Copenhagen, bikes and tags! July, 2014. The best way to get around in Copenhagen is by bike, and believe me, I hate to admit it! I’m not really the bike type, but as much as it annoys me, it’s totally the cheapest and easiest way to explore the city. Everybody rides their bikes everywhere and the infrastructure of Copenhagen is built for bikers so it’s easy and safe. Public transport is also a possible, fair priced and easy to use, but not nearly as quick as the bike. You could also walk, Copenhagen is not huge and the city is full of parks and canals, very beautiful walking environment. 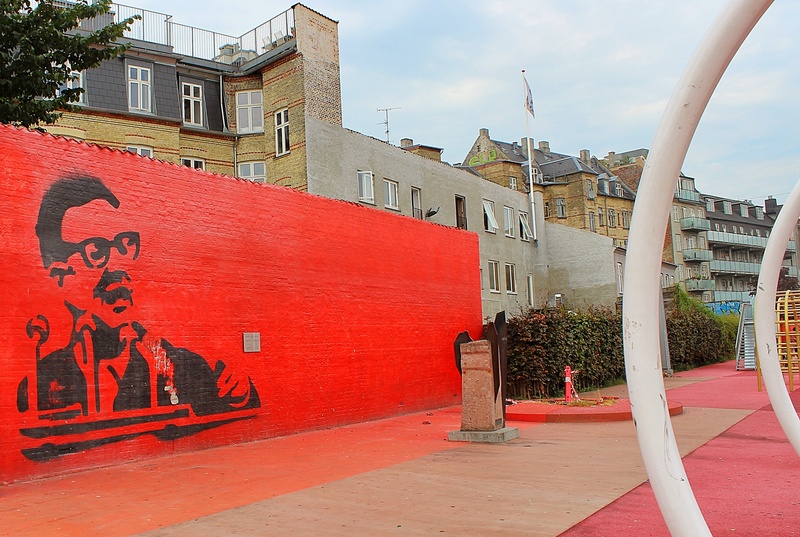 Salvador Allende mural in Superkilen park, Nørrebro. July 2014. Superkilen park is a huge playground in the middle of my favorite neighborhood, Nørrebro, in Copenhagen. It has skateboard and BMX ramps, basket ball courts, swings and of course, it’s surrounded by street art and graffiti! 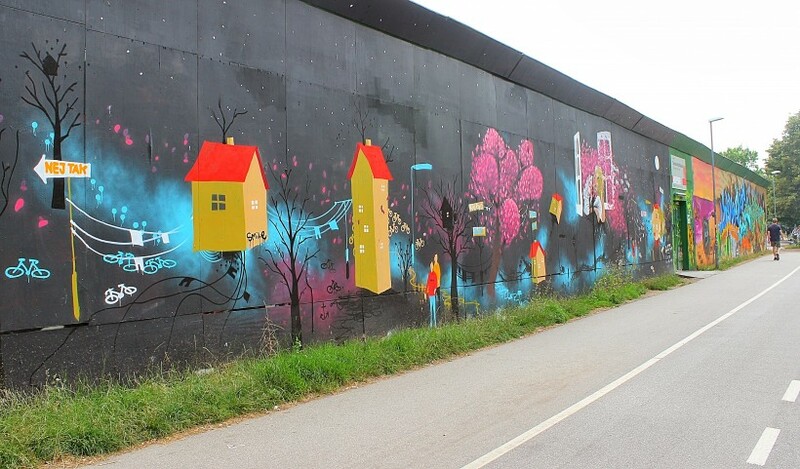 Great public space take over, a boring wall around a construction site – transformed! July, 2014. Even the walls to the basketball court are covered with beautiful graffiti! Nørrebro park, July 2014. 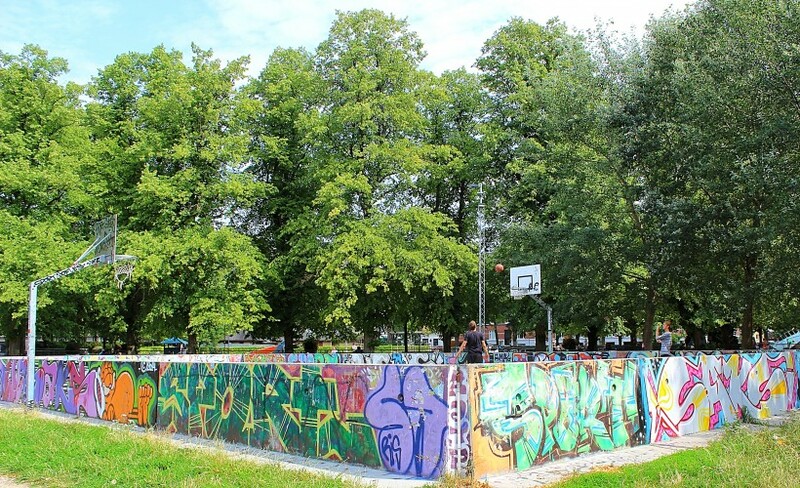 Another great park is Nørrebro Park, it’s mostly basket ball courts and large lawns for picnics – which is exactly what you should do here! Get some cheep beer and some yummy kebab takeout and hang out, you won’t be alone, if it’s a warm day, this is what people do! The park is surrounded by beautiful art, some examples of it follow below. 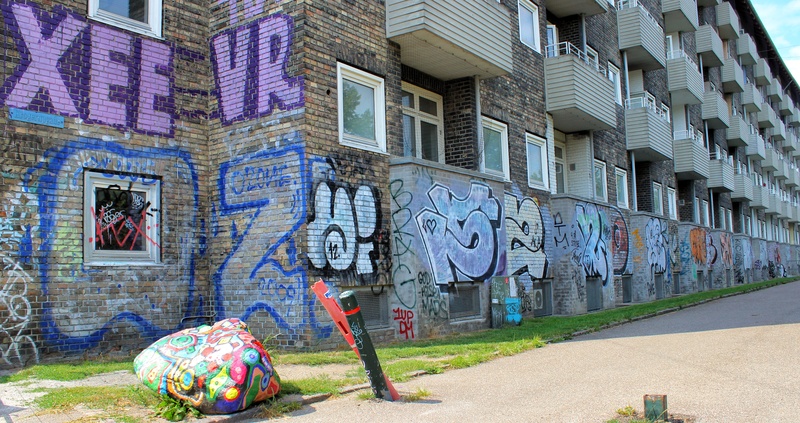 Fantastic public space take over – the side of a residential building around Nørrebro park. July 2014. 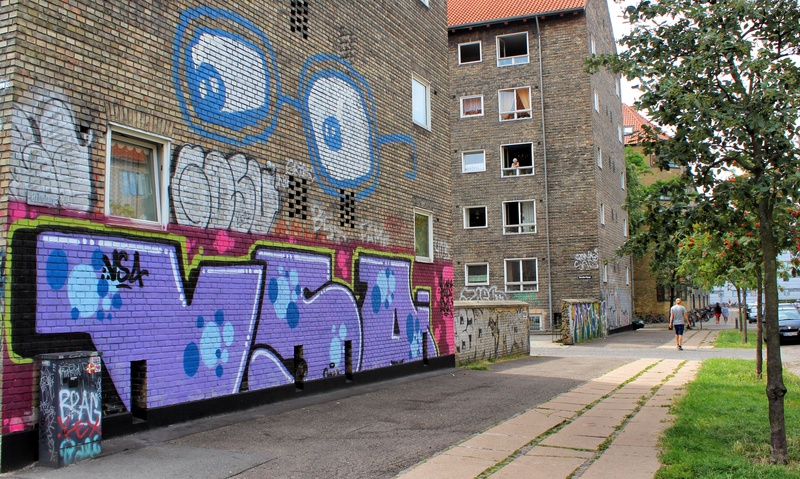 Fantastic public space take over – the side of a residential building around Nørrebro park. How great is that stone?! July 2014. If you rather go to a bar than sit outside, don’t worry, Copenhagen is very very bar friendly! A great spot in Nørrebro is Mikkeller & Friends on Stefansgade 35 and for yummy Ice coffee I can totally recommend Riccos on Stefansgade 15. If you happen to be enjoying Copenhagen on a rare hot summers day, go swimming! Around the canals, specially close to Langebro, there’s Islands Brygge, or my favorite Kalvebod Bølge. You won’t be disappointed! This entry was posted in Copenhagen and tagged all you see is crime in the city, copenhagen, graffiti, public space take over, street art, tags, throws. Bookmark the permalink. Diggin the name of your blog. Best documentary on early hip-hop, b-boy, and graff culture.